Artist's concept showing how the Bigelow Expandable Activity Module (BEAM), which arrived at the International Space Station in April 2016, will look after its May 26 deployment. Update for 8:45 a.m. ET: NASA called off its plan to inflate the Bigelow Aerospace BEAM module on the International Space Station today after flight controllers did not see the expected rate of expansion during early inflation attempts. Engineers with NASA and Bigelow Aerospace are studying the issue for a possible second attempt on Friday, May 27. Astronauts aboard the International Space Station (ISS) will inflate the orbiting lab's brand-new experimental habitat module this morning (May 26), and you can watch all of the action live. NASA astronaut Jeff Williams will lead the deployment of the Bigelow Expandable Activity Module (BEAM), agency officials said. You can watch the BEAM module's inflation live here, courtesy of NASA TV. The webcast began at 5:30 a.m. EDT (0930 GMT) Thursday, and the inflation was expected to begin 40 minutes later. The entire inflation process is expected to take several hours, according to a NASA officials. Expandable space habitats like BEAM, which was built by Nevada-based Bigelow Aerospace, provide more usable internal volume per unit of launch mass than traditional rigid modules do, advocates say. Bigelow has already launched two free-flying inflatable modules to orbit — Genesis I and Genesis II, in 2006 and 2007, respectively. But those missions were uncrewed, so the expansion of BEAM will mark the first time astronauts test out the technology in space. Researchers plan to investigate how BEAM performs in orbit — specifically, how it protects against space junk, solar radiation and temperature extremes, NASA officials said. If all goes according to plan, ISS crewmembers will enter BEAM several times a year over the next two years to acquire sensor data and see how the module is holding up. Astronauts plan to enter BEAM for the first time next week on June 2, NASA officials said. The 3,000-lb. (1,360 kilograms) BEAM arrived at the ISS on April 10 aboard SpaceX's robotic Dragon cargo capsule. In its compressed configuration, the module measures 7.1 feet long by 7.75 feet wide (2.16 by 2.36 meters). When fully expanded, BEAM will be 13.16 feet long and 10.5 feet wide (4.0 by 3.2 m) and will provide 565 cubic feet (16 cubic m) of habitable volume, NASA officials said. 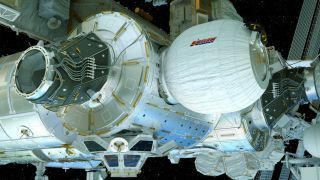 Bigelow Aerospace is dreaming much bigger than BEAM: The company is developing an expandable module called the B330, which will feature 11,650 cubic feet (330 cubic m) of internal volume. Bigelow envisions launching B330s to serve as private space stations and the backbone of human outposts on the moon and Mars. There's more spaceflight action on tap Thursday as well. At 5:40 p.m. EDT (2140 GMT), SpaceX plans to launch the Thaicom-8 communications satellite from Cape Canaveral Air Force Station in Florida, then attempt to land the first stage of the company's Falcon 9 rocket on a robotic ship in the Atlantic Ocean.